Along with the recently unearthed entry stairs, a major portion of the original entry wall has been unearthed. Following inspection, the team is now evaluating how this remnant of the original entry can be incorporated into the reconstruction. 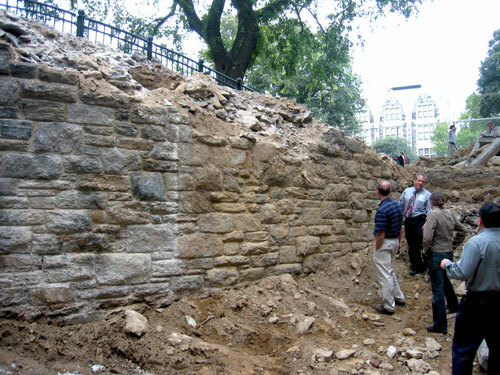 The wall, constructed of Manhattan schist likely from the building site, was buried under fill during a mid-twentieth century alteration. As part of the reconstruction efforts to the entire building, a new entry in keeping with George Post's original entry is being created. Stay tuned for continued updates from the field.